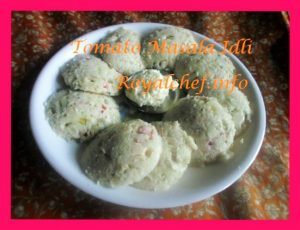 This is a step-by-step Recipe for making at home tasty Tomato or Tamatar Idli. This Idli variation makes the use of Tomato along with a a few fresh spices to give the normal Idli a spicy flavor. This Idli can be a useful breakfast or tiffin box dish for school going children. For the Idli Batter: Wash and soak the Rice and Urad Dal for 7-8 hours. Then grind them togeather into a thick paste and mix it well. Cover the batter and keep it aside for 7-8 hours. For the Tomato Idli: Chop the Onion, Tomato, Potato. Grind the Ginger-Green Chilies-Coriander. Roast and Powder the Cumin Seeds. Mix the Idli Batter, Onion, Tomato, Potato, grounded Ginger-Green Chilies Paste, Cumin Seeds Powder, Salt, Sugar. Then add a pinch of Soda-by-Carb and mix it well. Heat the Water in a Pressure Cooker and apply the Oil over the Idli stand and add Idli Batter into the Idli stand and keep it in the Pressure Cooker, close the Pressure Cooker without the whistle and steam the Idlis for 10-12 Minutes. 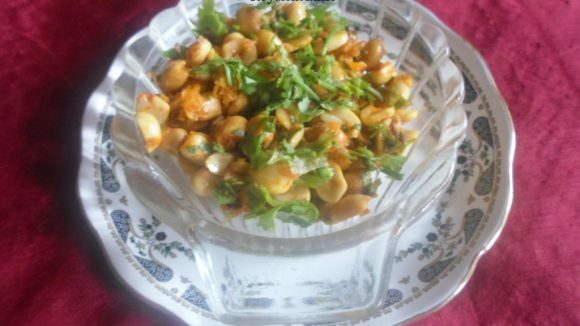 Remove the Idlis from the Pressure Cooker and serve hot. There is no need Chutney or Samber while serving the Idli.